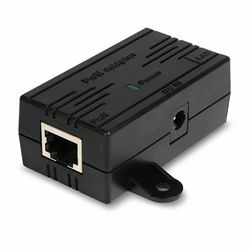 Locate your OM2P or MR500 Open-Mesh router nowhere near an AC outlet with this compatible DC Power-over-Ethernet injector. It puts 18V of direct current on the same patch cable that's carrying network data to your router. Both the OM2P and the MR500 internally extract the power from the data signal, so you only need to plug one cable into your router. Requires 18V 1A OM2P/MR500 AC adapter, not included.